Jaguar Dumps 575-HP F-Type SVR Engine Into XJ Because Why The Hell Not? Can’t really claim that Jaguar is a brand for old people anymore now can you? It’s taken quite a while for Jaguar to undo the damage that Ford’s time at the helm did to the company, especially when FoMoCo was spitting out S-Types based off the Blue Oval’s DEW platform that looked like the last base an aged owner would round before hitting the morgue. 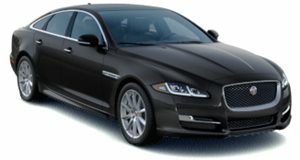 One exciting model at a time, Jaguar has shed its image as the transportation of choice for Britain’s elderly and the updates it's just given to its range-topping XJ sedan seem to cement that. New for the XJ model family is a new performance variant, the XJR575, which comes complete with the same supercharged 5.0-liter V8 that we see in the F-Type SVR. With that sort of help, the long-wheelbase luxury sedan kicks 575 horsepower to the rear wheels, allowing for a 0-60 mph launch to go by in 4.2 seconds before it tops out at 186 mph. That extra hot and extra-special Jag will come in two SVO-approved colors, Velocity Blue and Satin Corris Grey. It also gets unique 20-inch wheels, red brake calipers, quilted leather seats, and “575” badges in case the owners forget where the extra cash went. Speaking of that, the XJR575 won’t come cheap, starting at no less than $122,400. Thankfully, some of the new updates that the XJR575 sees will be available across the entire lineup, all the way down to the entry-level XJ R-Sport that starts at $75,400. These features include a new 10-inch touchscreen with Jaguar’s latest InControl Touch Pro infotainment software and a 4G Wi-Fi hotspot, which may as well allow the new advanced driver aids (Emergency Braking, Lane Departure Warning, Lane Keep Assist, Adaptive Cruise Control with Queue Assist, Reverse Traffic Detection, Blind Spot Monitor, Blind Spot Assist, Surround Camera System, and Park Assist) take over the task of driving. Be on the lookout for these new XJ features on 2018 models, which will be in dealerships this fall.